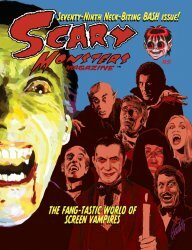 MyMovieMonsters.com > Scary Monsters Magazine > Scary Monsters 1-100 > Scary Monsters magazine #79 - Neck-Biting BASH Issue - Screen Vampires! The Chilling Seventy-Ninth NECK-BITING BASH Issue of Scary Monsters magazine. Featuring The Fang-tastic World of Screen Vampires! Will This be the Monster Bash to End All Monster Bashes? The Ghouls Next Door: Or What Happens When a Baby Boomer Meets TV's First Families of Fright! Monster Fest 2010 Pleases Again! 132 scary pages. See our MyMovieMonsters.com ad on page 101! All other ads, contact information and website addresses appearing in this magazine are no longer in effect. Please direct all inquiries to scarymonsters@mymoviemonsters.com.